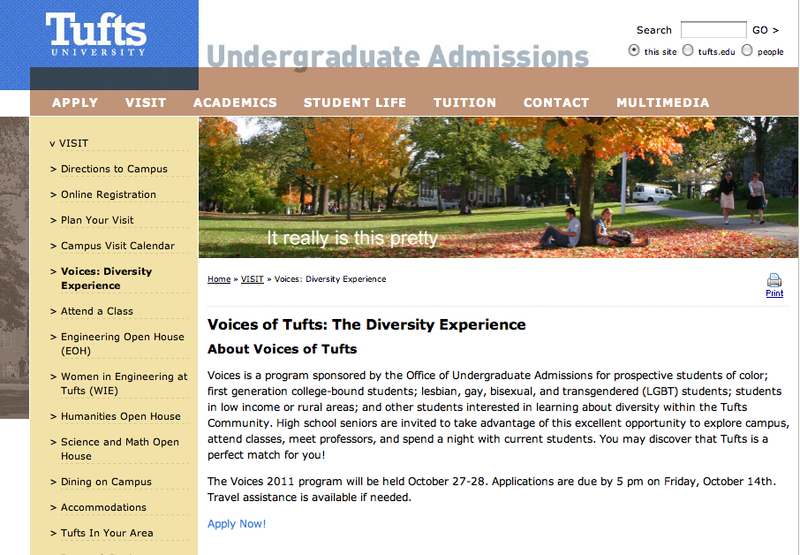 Seniors, take a look into Voices of Tufts: The Diversity Experience, an opportunity for students to explore campus, attend classes, meet professors, and spend a night in real college dorms. The two day event will be held on October 27-28 and provides free airfare to accepted applicants. The application deadline is 5 pm (eastern time) on Friday, October 14th and requires a short essay with one hundred words or less. Having visited the campus myself this past summer, Tufts University is located in beautiful Boston, Massachusetts, sharing the city with other numerous and prestigious colleges. I found the institution capable of catering to almost any interest in both Schools of Engineering and Arts & Sciences for undergrads. Tufts offers different study options and opportunities, independently or abroad, and over time, features graduate schooling in specified areas such as: Public Service or International Affairs; Nutritional or Biomedical Science; Veterinary or Dental Medicine. The smaller student population of about ten thousand is close-knit and seems to be genuine in the search for diversity and passionate, prospective students.